A sofa bed adds a practical and attractive way to provide overnight guests a place to sleep while at the same time offering extra seating when it isn’t used as a bed. When choosing your sofa bed and arranging it in your home, use the following tips to achieve the most practical and decorative appeal. How you answer this question helps determine the type of sofa bed mattress you should choose plus where to place the sofa bed in a room. If someone will be sleeping on the bed at least once a week, you should choose a sofa with a high-density foam sofa bed mattress (2.5 pounds/cubic ft.) because this will hold up over time without sagging. Mattress density isn’t as important if the bed is used only occasionally because the foam will have time to spring back (in this case a 1.8 lbs per cubic foot density will do the job nicely as well). Likewise, if the bed is used frequently, you should place it in an area clear of obstructions that could get in the way of quickly transforming the sofa into the bed. It should be set away from unmovable architectural features and large decor items, such as coffee tables, armchairs, statuary and potted floor plants. When the bed feature of the sofa bed will be used infrequently, you have more placement leeway. However, you will want to follow some rules. For example, when using it as a sofa, don’t let it stand alone. Instead, create a conversation area by arranging armchairs and end tables with it just as you would any sofa. Choose a style that matches the rest of your interior style. For example, if your interior decorating style is Country cottage, a black leather upholstered sofa bed might look too heavy and out of place. Sofa beds come in many styles, from overstuffed wood-framed to sleek-lined metal-framed. Try to match the style to other furniture in your home so that you retain design harmony. Like style, color is very important and it should work well with the color palette of the space. However, you do have flexibility if you cannot find the exact color you want. 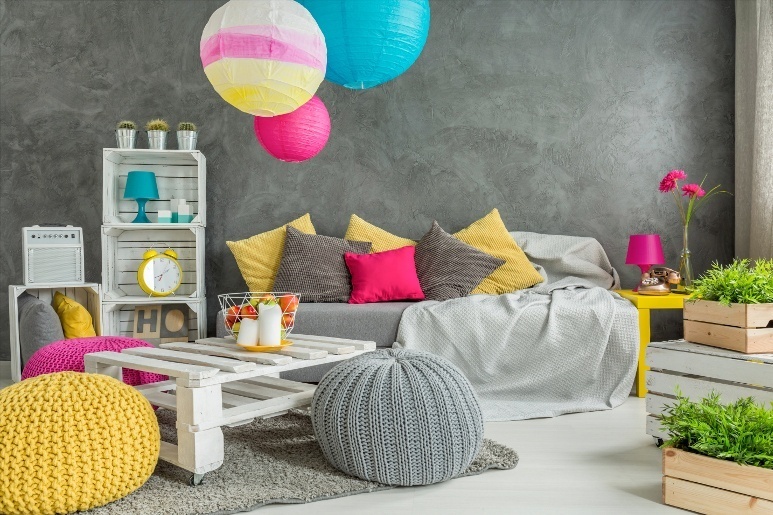 You can use coordinating colors, patterns, textures, and themes to connect your sleeper sofa with the rest of the room’s décor. Add decorative throw pillows and blankets that blend with other furnishings as focal points for the sofa. The great thing is that you can change smaller items based on the holiday or season, such as Christmas or summertime, for a completely new look that will make the area seem refreshed and welcoming. Remember that not everything needs to match exactly, and that you can maintain design flow by adding the right colors of throw pillows/blankets. Determine if your sofa bed is going to be in a formal living space or if it will be in a casual area of the home. Throw pillows and blanket throws have a big visual impact and the wrong kind, or mismatched ones can easily give the wrong impression in a formal space. After making that determination, look for accessories in colors that harmonize with the room’s color palette. One ideal storage solution for your sofa bed is a storage ottoman. By placing the bedding in one of these, you’ll keep the bedding accessible and near the sofa. You can also use these for storing extra pillows or throws for guests. Remember to choose your sofa bed with quality in mind. A well-made sofa bed can offer many years of practical and attractive use, and your careful consideration now can make a difference later. If the original mattress the sleeper sofa comes with doesn’t appeal to you (they are usually of a lower quality in order to reduce costs), you can always buy a replacement sofa bed mattress. This entry was posted in Sofa Bed Tips and tagged Buying a sofa, Interior design.